Mitzi designed the stylish vintage Leigh mini pendant with clear glass panels and a cool white finish to give it a stylish modern feel. A new take on a Victorian favorite, the Leigh mini pendant from Mitzi collection gives a handsome pastel finish to a vintage style for stylish indie appeal. In a white tone, it's paired with polished nickel hardware for a pleasing color palette that designers love. This Hudson Valley design is the perfect transitional addition to a variety of covered exterior spaces. 18 3/4" high x 11 1/2" wide. Canopy is 6" wide. Weighs 18 lbs. Includes 4 1/2-feet of chain. Takes four maximum 60 watt E12 candelabra base bulbs (not included). Leigh contemporary four-light mini pendant from Mitzi collection by Hudson Valley. Polished nickel and white finish over steel construction. Clear glass panels. Showcasing a bold black frame with polished nickel accentsthis transitional pendant offers understated style. 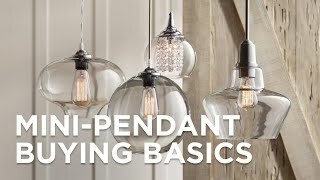 Bring a touch of vintage charm with the fresh take on a classic lantern of this energy-efficient LED mini pendant by Modern Forms.